Walter Hussey, sometime Rector of St Matthew's Church Northampton and then Dean of Chichester, is an important figure in 20th-century art and music. Hussey was responsible for commissioning such figures as Benjamin Britten, Edmund Rubbra, Leonard Bernstein, Lennox Berkeley, Henry Moore, Graham Sutherland, John Piper, Marc Chagall and many more. 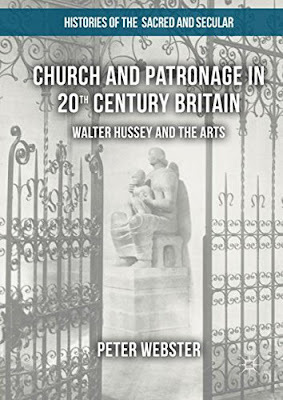 Peter Webster's book Church and patronage in 20th century Britain: Walter Hussey and the Arts in Palgrave Macmillan's Histories of the Sacred and Secular series provides some remarkable illumination as to how this striking body of work came about. The book is not a biography, it is, in fact, an academic study of both Hussey and the role of the arts in the mid-20th-century church of England. But anyone who is interested in learning more about the creation of Britten's Rejoice in the Lamb and Leonard Bernstein's Chichester Psalms will find this a fascinating and illuminating read. Webster writes easily and engagingly so that the book has a far from academic tone about it. Webster explains early on on the book that Hussey's surviving papers, whilst extensive, do not always provide the ability to look into Hussey's motives, partly because he rarely kept copies of his own letters. Importantly for a book which endeavours to put Hussey's artistic endeavours within the context of the 20th-century church, Hussey has effectively left little information about his devotional beliefs, or given a detailed theological basis for his commissioning activity. Webster does a great job in following the history of Hussey's activity and putting it in the right context. Hussey's commissioning was not simply as a patron, but as church patron and the art was intended to sit within the liturgical atmosphere of the church. Apart from Leonard Bernstein's Chichester Psalms, all the music that Hussey commissioned was intended for performance during a church service, it had to fit in. Similarly, works of art, like the two Graham Sutherland pictures, the Henry Moore sculpture, the John Piper tapestry and the Marc Chagall window, had to fit into a church environment elicit the right response from the churchgoers. Whilst we may not always be able to discern Hussey's exact reasons for a particular commission, Webster does a great job in putting it into context and covering the various responses. One rather interesting point he makes is that a choir might perform a piece of music just two or three times per year meaning that dissenters could easily avoid it, but that a work like John Piper's tapestry for the high altar at Chichester Cathedral was nowhere near was easily avoided and hence drew greater criticism. When you look at Hussey's rather haphazard methods and tendency to rely on personal connections, it is remarkable that he drew such success, commissioning Britten, Berkeley, Tippett, Rubbra, Graham Sutherland and Henry Moore for St Matthew's Church, along with John Piper, Sutherland, Marc Chagall, Ceri Richards, Walton, Berkeley and Bernstein for Chichester Cathedral. This is not the complete list, and part of the fascination in the narrative is the list of less iconic works which Hussey also commissioned, though during his Chichester period it is not always clear whether Hussey was involved or not in the commissioning. Early on in the book, Webster quotes Percy Dearmer, 'The object of art is not to give pleasure, as our fathers assumed, but to express the highest spiritual realities. Art is not only delightful, it is necessary', and this is probably as close to an artistic credo for Hussey as we can get. Whilst he did have emulators, as the 20th century drew to its final quarter, the mechanisms of patronage changed greatly and Hussey's very personal approach, which avoided dealing with the parish council, Friends of the cathedral and the chapter until quite late in the commissioning process, certainly do not give us a model for today. In retirement, Hussey had one final project, he managed to persuade (or perhaps a stronger term might be more suitable) Chichester to back his project to create a contemporary art gallery in the city, using his own fine collection of contemporary art as bait, the result is of course the Pallant House Gallery. It is also clear from the book that Hussey had a great gift for friendship, and he remained close to many of the artists he commissioned and future commissions were often started through friendly contacts. Another aspect that Webster touches on is that Hussey was homosexual, and it cannot help but be noticed that a number of the men he commissioned music from were of a similar persuasion. There is perhaps an interesting book to be written covering this area, but that lack of personal papers from Hussey would might this difficult. This year is Leonard Bernstein's centenary and along with much else of his output, Chichester Psalms rightly being celebrated. This book provides a highly readable, well researched and engagingly written examination of exactly how this work and many others, came into being. Being an academic book, it does not come cheap so my best advice would be to persuade your local library to get one or to wait for the paperback edition.